Do you know how we know Subaru loves us? Because instead of taking wagons away from us like other stingy automakers, they're giving us MORE WAGONS. Thanks, Subaru! Meet the Subaru Levorg Concept, which is set to debut soon at the Tokyo Motor Show. It's called a concept, but as Carscoops notes, it looks pretty much production ready as it is right now. When Super Dimension Attack Wagon Levorg was first announced, we thought was the new Subaru Legacy wagon. Instead, it may end up being an entirely new model. In terms of size the Levorg sits between the Impreza and the Legacy in Subaru's lineup. 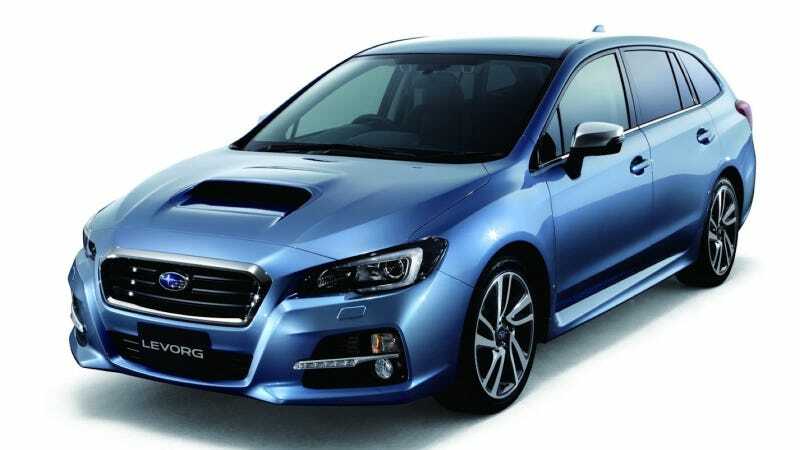 Subaru says Levorg buyers will be able to choose from either a 1.6-liter or 2.0-liter boxer engine, both turbocharged for your speeding pleasure. The first is rated at about 170 horsepower, the second at about 300 horsepower. Both are equipped with Subaru's Lineartronic CVT gearbox; no mention of a manual transmission is made. Other goodies include the latest generation Subaru EyeSight crash avoidance system. Check out more photos below and a video with some supremely badass music. LEVORG! Update: Here's an interior shot. There's more live shots too over at Paul Tan's website. Looks a lot like the new WRX. I really dig that flat-bottom steering wheel.